Here is an outfit for you all! I've been eyeing this blouse since I saw it on someone I think but I didn't know where it was from, then when I finally found it, it was sold out! I was desperate, but thanks to Fei who told me it came back in stock I was able to get it! There are 3 colors and I got the three! Here is one with the first blouse! 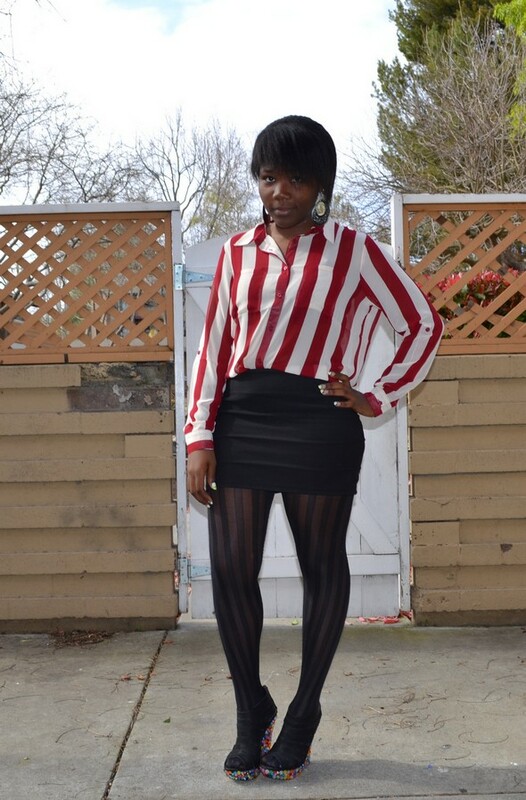 I emphasized on the stripes that's why I wore striped tights also! I hope you like it! Joyeuses Pâques a vous tous! Voici une tenue pour vous tous! Je guettais ce chemisier depuis que je l'ai vu sur quelqu'un je pense, mais je ne savais pas d'où il venait, puis quand j'ai enfin trouvé, il y'en avait plus! J'étais désespérée, mais grâce à Fei qui m'a prevenu qu'il y'en avait à nouveau en stock, j'ai pu l'obtenir! Il ya 3 couleurs et j'ai pris les trois! Voici le premier! J'ai voulu me concentrer sur les rayures, c'est pourquoi j'ai porté des collants rayés aussi! J'espère que vous aimez! Dee!!! tu me tue ces derniers jours avec tous tes looks!!! j'aime trop la chemise legere a rayures, ca donne du cash au look ! bien coordonnee avec la jupe et les chaussures en plus! Lucky you! Manage to get your hands on what you really wanted! I'm so glad you got it because you look great in that top! It looked so comfy. Merci beaucoup Lucie! Je l'ai eu a Forever 21! Tu me scotches avec ta chemise. Oooo I'm in love with all the stripes!! 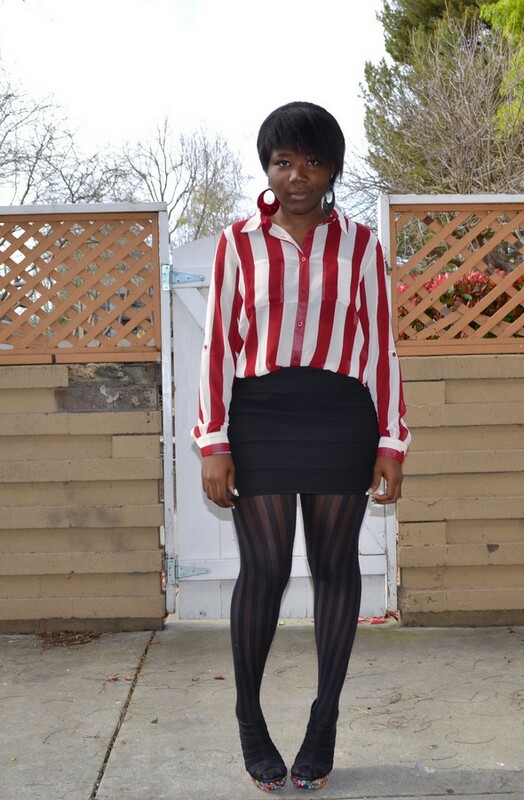 Especially the red and white striped top, amazing! PARFAIT ma belle....C'est toi la reine des associations! Tu sais comment faire avec les couleurs!! J'adore! cute stripes on stripes! hyped!! Ton collant est magnifique... Mon blog est tout neuf alors passe le voir quand tu as 3sec et laisse un petit mot :) XOXO Bonne continuation. just came across your blog & really like it!! Love the stripe on stripe combo, so chic and cute. You look beautiful. i've been looking for a shirt like this for ages! Oh wow so damn cool , cuz most people have the black and white version, but this one is so much cooler! The red and white striped shirt looks great on you!